A straight line drawn parallel to a side of a triangle, divides the other two sides proportionally. We shall try to prove the converse of basic proportionality theorem. 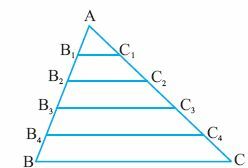 Let us consider triangle ABC shown in the figure below. Divide the sides of the triangle AB and AC into any number of equal parts. By measuring the angles B1 and B we observe that they are equal. But B1 and B are corresponding angles. Example: In the figure, find the length of PS given that ST ll QR. 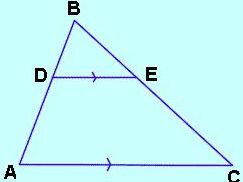 Q 1: In triangle ABC, D and E are the points on AB and AC. BD = 30, DA = x, BF = y, EC = 15, AC = 22. Find AD. Q 2: The diagonals AC and BD of a quadrilateral ABCD intersect at O such that AO/OC = BO/OD. In such a case, ABCD becomes a trapezium. Q 5: In the figure, is PQ ll EF. State yes or no. 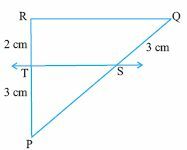 Q 6: A research team wishes to determine the altitude of a mountain as follows: They use a light source at L, mounted on a structure of height 2 meters, to shine a beam of light through the top of a pole P' through the top of the mountain M'. The height of the pole is 20 meters. The distance between the altitude of the mountain and the pole is 1000 meters. The distance between the pole and the laser is 10 meters. We assume that the light source mount, the pole and the altitude of the mountain are in the same plane. Find the altitude h of the mountain. Q 7: ABC is a triangle. D and E are points on AB and AC. If BD = 4 cms, AD = 8 cms, CE = 9 cms. Find BE. Q 8: In the figure, are the lines EF, AB and CD parallel to each other. State yes or no.